When it comes to endurance events you could say that the Badwater Ultramarathon takes the ultimate prize. Forget running a marathon or a 100-mile ultra. Even an Ironman's 140.6 miles could seem a little easier than the Badwater challenge--after all, you're on a bike for 112 of those miles. But Badwater? It's 135 miles through Death Valley, starting below sea level at Badwater Basin and climbing to Whitney Portal, the trailhead for Mt. Whitney, 8,360 feet up. It started yesterday morning, July 12, with runners starting as early as 6 a.m. Keep in mind that wiith its mid-July event date, participants expect to face some of Death Valley's most grueling and heated conditions. It's been labeled the "world's toughest foot race" and has tested the likes of Dean Karnazes, Pam Reed and Scott Jurek, all ultramarathoners who have won the race within the last decade. Bart Yasso told stories about his experience at the race in his book My Life on the Run--something about bananas, hot pavement, a stench and shoes practically melting (I'm recalling his retelling at a rest stop somewhere along the MC200 relay--little sleep, tired legs, nearly nil memory retention.) And you have to be invited to participate. So how does a runner from Aurora, Ill., end up at such a famous ultra race? He runs far, he's fast and he's been winning other ultra-distance races for a few years, making it look easy in the process. He's 30-year-old Zach Gingerich. Not to be confused with the professional runners of the world, he works a regular day job at a desk (his Badwater bio says he's a business analyst and when I interviewed him for a story I was working on last summer he showed me a clip where CBS News profiled him at work and running) and does the running on the side. But he can run pretty fast especially as he logs more hours--and he has the stamina to perform these 20-plus-hour runs. But his current claim to fame? 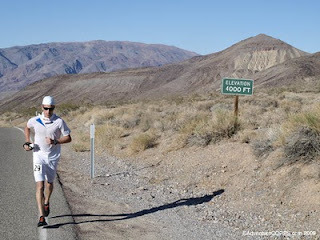 He's leading this year's Badwater with four miles to go. After starting from Badwater Basin at 10 a.m. yesterday--the last field to depart, Gingerich rallied among the field to solidify a spot near the top. He's familiar with the position after finishing third last year, but like anyone, he's hungry for a win. Following the field yesterday, bedtime brought a peek at the results to show Gingerich holding steady in third place. But things changed overnight. At the 90-mile checkpoint, he moved up to second place, covering the distance in 16 hours, but still 30 minutes behind the leader Marcos Farinazzo. But Gingerich made a move in the next 32 miles and leapt into first place, clocking 21:38 for 122 miles and watching Farinazzo slip away; Farinazzo covered the same distance in 23:46 and fell to fourth place. At the 131-mile checkpoint, Gingerich was still maintaining his lead but has Oswaldo Lopez just 17 minutes back on his tail. Close behind them is female leader Jamie Donaldson, who covered 122 miles in 22:53. Now it's the final stretch to the Mt. Whitney trailhead to finish their journey. Here's to hoping a local boy can take it home. Follow the coverage online or through the Badwater Twitter feed. Photo provided by Zach Gingerich.